Grapefruit juice is known to interact with a number of medications, increasing their effect to often toxic levels. So, when it comes to Plavix (clopidogrel), a blood thinner medication used to decrease the prevalence of stroke and myocardial infarction, is it safe to consume the fruit juice? The short answer is "no." How Does Grapefruit Juice Interact With Plavix? 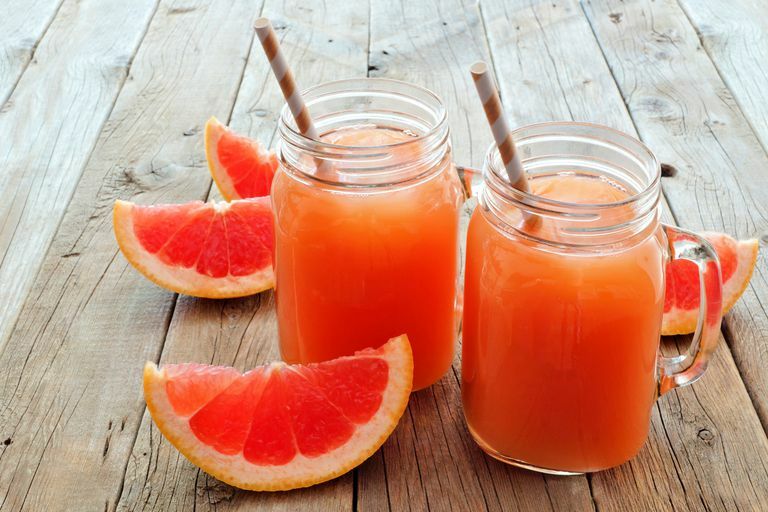 A 2014 study found grapefruit juice inhibits both the CYP3A4 enzyme, of which clopidogrel is a substrate, and the CYPC19 enzyme, which metabolizes the drug. Grapefruit juice may therefore interfere with the conversion of clopidogrel to its active form, thus decreasing the drug's antiplatelet effect necessary for preventing a stroke or heart attack. In the body, clopidogrel is metabolized using the CYP2C19 enzyme. However, certain people are poor metabolizers of the CYP2C19 enzyme. These people are resistant to clopidogrel. Although there is a blood test to identify clopidogrel-resistant patients before the institution of therapy with the medication, this test is not widely used. Of note, people who are poor clopidogrel metabolizers, also have an increased relative risk of dying of cardiovascular events or stent thrombosis. Grapefruit juice can be a healthy component of any diet. If you are on heart medications, please discuss whether it's a good idea to drink grapefruit juice with your physician or another healthcare provider. Be sure to inform your healthcare provider of all medications you're taking and the dosages of these medications. It's always a good idea to carefully read the printed handout that comes with clopidogrel. There should be a section about interactions between clopidogrel and other medications. If you did not receive a package insert, ask your pharmacist for a copy. If you are using any over-the-counter (OTC) medications or dietary supplements, you should talk to your pharmacist and doctor about potential interactions. You should be especially careful about using medications for inflammation like ibuprofen and OTC supplements that contain ginkgo. A side effect of these products is bleeding. Krasowski MD. Pharmacogenomics. In: South-Paul JE, Matheny SC, Lewis EL. eds. CURRENT Diagnosis & Treatment: Family Medicine, 4e. New York, NY: McGraw-Hill; 2015. Trevor AJ, Katzung BG, Kruidering-Hall M. Pharmacogenomics. In: Trevor AJ, Katzung BG, Kruidering-Hall M. eds. Katzung & Trevor's Pharmacology: Examination & Board Review, 11e. New York, NY: McGraw-Hill; 2015.